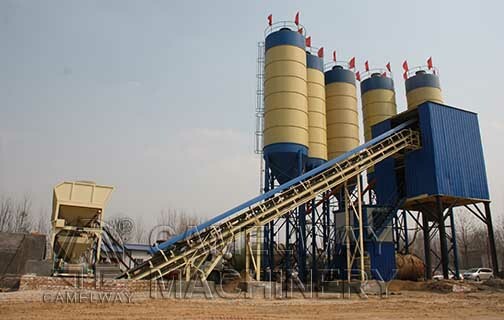 What should pay attention when use the concrete mixing station. As a China-based professional hopper concrete mixing plant manufacturer and supplier, Zhengzhou CamelWay Machinery manufacture will introduce the use points of concrete mixing station to you. New equipment before use must pass a professional installation and debugging. After technical performance indicators all conform to the rules and qualified experience, it can be put into use. Power supply voltage, capacitance, frequency, phase sequence must conform to and electrical requirementsof mixing plant equipment. The various parts of the machine should be observed after the start running situation, and check the oil, gas, water pressure. Aggregate size should be consistent with the performance of the mixer, particle size within the permission scope shall not be used. During the machineryrunning, the lubrication and adjusting work may be undertaken. Forbid to put hands into the hopper and mixing barrel. You mustn’t stop in mixing.If the failure or power failure, shall be immediately cut off the power,and the concrete within the mixing barrel should be cleaned, then for repair or waiting for the power supply. If you want to buy the concrete equipment, please feel free to contact us at any time. This entry was posted in Algeria Batching Plant and tagged Concrete Batching Plant by camelway. Bookmark the permalink.